NEW Calder Cannons Female Talent Manager, Russell Humphrey is buoyant about the future of the Cannons after a strong pre-season with plenty of standouts. After taking out the inaugural 2017 premiership with future AFL Women’s young guns, Chloe Molloy, Monique Conti and Sarah Dargan on the list, the Cannons had a lot of bottom-agers in 2018, winning only the two games but getting better with every match. Now with another season under their belts, the Cannons are expected to improve again and with plenty of Under 16s forcing their way into the line-up, the next few years are looking good for the Craigieburn-based side. Humphrey said while new to the role, he was a familiar face around the club, having worked with the premiership-winning girls side in 2017, before assisting the boys last season. Humphrey said looking at the practice game against Western Jets, and the clash between Northern Knights and Sandringham Dragons, he felt the Cannons were in a good position. This year, Madison Prespakis has joined Conti, Molloy and Dargan in the AFL Women’s competition and already showed why she was taken as the first Victorian metropolitan pick. While the Cannons will be minus Prespakis in 2019, Humphrey hopes the ball magnet has left a legacy with the now top-age group. Humphrey said the Futures squad of Under 16s were already promising signs for the future. Stepping up into Prespakis’ shoes is never going to be easy, but AFL Women’s Academy member and All-Australian in her bottom-age year, Georgia Patrikios has been the clear standout over the past few years. Humphrey said Patrikios has plenty of tricks that will attract AFL Women’s recruiters throughout the year. Having mixed between midfield and forward last year, Humphrey hopes to use Patrikios’ agility and pace as a run-and-carry player to create a “60-metre player”. Other than Patrikios, Humphrey said the Cannons had a few other players to keep an eye on throughout the season. “Krstel Petrevski has got some good attributes,” he said. “She uses the ball well, she can get it … she needs to tidy up below her knees on ground balls, but she’s getting better at it, she just needs to keep improving. “Makeisha Muller is one we got from Gippsland last year who moved into the area. I think she’s draftable, she’s an X-factor player. “She’s worked really hard in the pre-season. “We’ve tracked her with the GPS pretty much the whole pre-season because she wanted that, she wanted to know how hard she was working. “My smokey from our point of view is Alana Barba who can play in the middle, half-back and can go forward and probably even on the wing. “I see how hard she’s working, her kick’s not elite, but it’s better than okay. “Her leg speed and ability to get out of a pack is probably second to Patrikios at times. She seems to now understand that she’s got to run both ways … I think her playing down back has helped that too. Humphrey said the coaching staff was pleased with how the girls had prepared for the upcoming season, which begins on March 2 at RAMS Arena. The Cannons face Western Jets, a side they played on the weekend. One thing to expect is plenty of Futures making their way into the Cannons squad, with Humphrey naming Tahlia Gillard – a 187cm centre half-back – and Georgie Prespakis – sister of Madison but with different attributes – among a host of Under 16s to watch this year. “When we looked at our list this year, we looked at our under 16 girls as top-age players,” Humphrey said. “What are they going to be like in 2021? “How will they go there as top-age players rather than the now. “I know everyone says it, but you like to think of this Under 16 group we could get two or three drafted again. “Which is a possibility because it will be a bigger pool with other AFL clubs coming in other years. IF anyone ever had any doubts about the future of AFL Women’s, then they need look no further than this week’s V/Line Cup. The best 14-16 year-olds from across regional and rural Victoria tackled each other in Gippsland in the annual tournament held at Moe, Morwell and Traralgon. Walking away from the event, I was blown away by the quality of the competitors, not just in terms of skill development, but in terms of game smarts and decision making. Put it down to coaching, natural development or other factors, the women’s game is growing, fast. Having watched the inaugural TAC Cup Girls competition in 2017, you had your absolute standouts like Chloe Molloy and Monique Conti tearing it up for Calder Cannons, and everyone had been talking about Isabel Huntington for years. Then there were the next group of talented players that made their way onto AFL Women’s lists such as Maddy Guerin, Sarah Dargan, Iilish Ross, Bridie Kennedy and Georgia Gee, plus others. 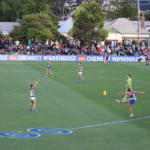 Fast forward 12 months, and attending the TAC Cup Girls competition in 2018, I attended 26 matches in the nine round season, and instead of having two or three unbelievable players, that had grown into double figures – that is, of players who could seriously impact at senior level almost immediately. Geelong Falcons duo Nina Morrison and Olivia Purcell were outstanding against their peers, and had no troubles finding the ball at higher levels. Mikala Cann is a perfect example of how players from other sports can adapt in such a short amount of time, while Emerson Woods joined Cann as a premiership player at senior level. Even at the AFL Women’s Under 18 Championships, having witnessed all the games on the Gold Coast, you saw those players who had starred at TAC Cup Girls level, go up to face the best players from across the country. Talents like Alyce Parker, McKenzie Dowrick, Nikki Gore, Nat Grider, and Chloe and Libby Haines showed why they had been held in such high regard in their respective states. All of the above earned invites to the National Draft Combine. But what was just as pleasing at those championships, was the development of the bottom-age players who shone through. It is hard to believe the likes of Georgia Patrikios, Gabby Newton, Lucy McEvoy, Lily Postlethwaite, Montana McKinnon, Mia King and Mikayla Bowen should all be running around on the Gold Coast for their respective states again next year. Remarkably, the 2020 draft crop already has names that are worthy of representing their state, as Abbey Dowrick, Abbie Ballard, Netty Garlo and Zimmorlei Farquharson were among those double bottom-agers who still matched it with more experienced players. Add in the likes of Ellie McKenzie, Isabelle Pritchard, Renee Saulitis and Tyanna Smith who were all impressive for the Victorian Under 16s outfits, and the foundations for the future are certainly there. 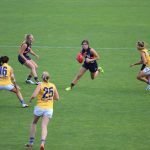 An extra element will be the possible father-daughter selections, with Abbie McKay (Carlton) being the first possible case study this year, while Tarni Brown (Collingwood) and Alice Burke (St Kilda) loom as two more. While we will go into more detail about the V/Line Cup recap next week, the overall standard of the competition was arguably equal to or even better than the 2017 TAC Cup competition. Or in other words, the players are two to three years more advanced than their predecessors. 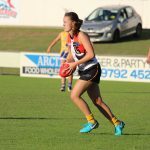 In the Geelong Falcons game against Bendigo Pioneers, there were two players that were worth highlighting even early on in the game. In one instance, a player was against two opponents just inside 50 and the easiest option would have been to bring the ball out and cause a forward stoppage. Instead, she tapped the ball in front of her, not taking possession, but maintaining speed, and kept dribbling it ahead of her pursuing opponents, then without even taking possession, managed to kick it off the ground into the goal square, where a teammate soccered it through. The second example was even better, and exemplified the game sense that players have developed over time. A player had the ball tight against the boundary line under pressure not far from the behind post. In year’s gone by, regardless of competition, most young players, especially at the age where goals are usually the only statistical measure you can brag about to your mates on the league website, would blaze away and go for the miracle snap. With so many opposition players inside 50, it would have been the easy option, and no-one would have blamed her for doing so. Instead, she calmly assessed her options and spotted a teammate amongst the chaos about 25m out, sending a nice kick to her advantage, setting up an easy shot on goal. Without being their live, you do not see these things, but it is little moments like that, which make all the difference. Another example, just to show it was not just one game, was on the second day when a Western Bulldogs Next Generation Academy (GWV Rebels region) player won the ball at half-back. She won the ball in defence, had an opponent chasing her from a 45-degree angle to close her down, and backed her speed to take her on and get around her. She did just that, but looking ahead, the opposition had blocked up the easiest option along the wing. She would have to kick long to a contest, probably outnumbered. Instead she briefly glanced inside and in one of the toughest kicks to do, managed to hit that kick around her body to the defensive 50 where a teammate marked, and not only was it an effective kick, but it opened up the corridor, and the game, with the opponents already set in running towards the wing. Aside from the few examples, there was more contested marking, more protecting of ball drops and ground balls, more fend-offs, more deft taps to teammates. Areas in which players generally do not always think of as first options. But the past week, it was happening more and more. There is no doubt there has been some serious critics of women’s football, and no doubt that will continue, but if you can stop and look hard enough, you do not have to look too far to see the game is blossoming, and I for one, am excited for what 2019 and beyond holds. THERE are plenty of talented players who have followed the Youth Girls pathways, but the name Madison Prespakis is one that has been frequently mentioned within the pathways. With accolades that include TAC Cup Girls Best and Fairest, two-time Vic Metro Most Valuable Player, joint overall Most Valuable Player at the National Under 18 Championships and Calder Cannons Best and Fairest – all of that coming in the past 18 months, Prespakis is building a CV that is equal to any junior footballer, boy or girl. But just where did it all begin for the talented Cannons captain? With the passion for football always around her in the household, Prespakis said there were very few moments where she was not analysing some part of her footballing life. In the two years of the TAC Cup Girls, Prespakis has experienced both the highs of a premiership, and the rebuilding stage in 2018, leading a number of talented bottom-agers this season. Prespakis has as much humility as she does natural talent, and for the tough onballer, winning the Vic Metro MVP in her bottom-age year was a learning curve in regards to external noise. The Vic Metro captain had put expectations to the back of her mind ahead of this year’s AFL Women’s Under 18 Championships, so much so she was just taking it one step at a time. Unsurprisingly, Prespakis did more than just make the squad, she shared the captaincy, and took out both the Vic Metro and tournament MVP awards, standing out across the midfield and going forward when required. Across all levels, Prespakis felt more prepared for what was coming, as did the other girls on her respective teams. 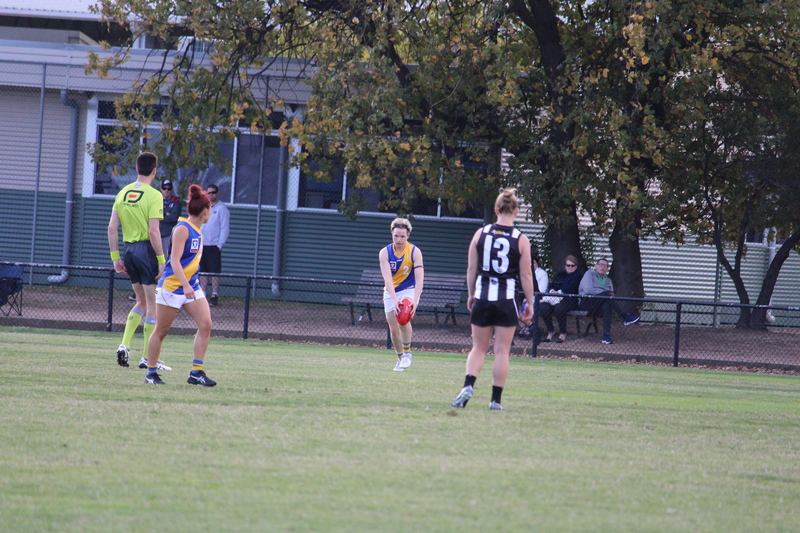 Prespakis also stood out against the senior players in the Victorian Football League (VFL) Women’s competition, learning a lot at Melbourne Uni and being named in the best every game she played. Last season the Calder Cannons had three players drafted – Chloe Molloy, Monique Conti and Sarah Dargan – all of whom tasted AFL Women’s action in season 2018, with Molloy taking out the Rising Star award, while Conti was best on ground in the grand final. Prespakis described her key strengths as her power through stoppages and her kicking – something that was evident in season 2018 across all competitions. Like most girls, Prepakis has balanced her football with study and work, something she has got the hang of the past few years. With October’s National AFL Women’s Draft approaching, Prespakis is hoping to live out her ultimate dream. ROUND four sees many TAC Cup Girls stars come into line-ups for their first ever stint in the Victorian Football League (VFL) Women’s. The Western Bulldogs, Williamstown, Casey and Essendon are the teams without wins at the moment and would be keen to get on the board this weekend. 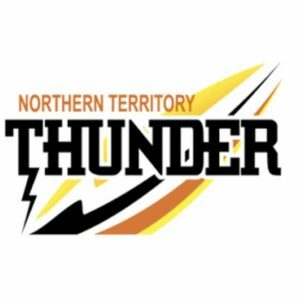 Melbourne Uni take on NT Thunder to kick off round four. Coming off the bye, Melbourne Uni have made no team changes with all players well rested after their round three bye. Calder Cannons’ jet Madison Prespakis has been named as the 23rd player and will no doubt be one to watch throughout the season. On the other hand, Thunder have made seven changes to their side. They have called upon five debutants to take to the field including Sally Riley, Kylie Duggan, Jemma Iacono, Sophia Mauboy and Sue Nalder. Also pulling on the Thunder jumper for the second time this season will be Adelaide AFLW players, Sophie Armitstead and Marijana Rajcic. However, the Thunder do lose Palmerston Magpies talent, Janet Baird. Lucy Adam, Michelle Ellis, Tahlia Holtze, Rhiannon Metcalfe and Deni Varnhagen will all be rested while Eloise Jones is out with illness. Darebin also go into round four unchanged after its bye last weekend, however have named Eastern Ranges defender Lauren Szigeti as the Falcons’ 23rd player. Casey Demons have made a few changes after their narrow loss to the Saints in round three. Lorianne Lowerson, Sally Fyfield, and Dandenong Stingrays captain, Jordyn Allen have secured spots in the round four side while Lucy Rutter, Georgia McLean and Stingrays forward and AFLW Academy member, Brooke Struylaart will be awaiting their opportunity, named as emergencies. 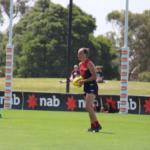 The Demons have named star defender, Katherine Smith out alongside fellow Melbourne teammates, Jasmine Grierson and Aliesha Newman. The Western Bulldogs, who are also coming off last weeks bye, have followed suit with Darebin and Melbourne Uni, naming an unchanged side. Their opposition will be looking for their third win of the season after last week’s pumping against Richmond. Collingwood AFLW defender, Sarah D’Arcy will be a big out for the Magpies, however the addition of Collingwood’s AFLW vice-captain, Brittany Bonnici should bring experience back to the side. Collingwood also look to bring in Bianca Jones, Grace Knox, Ally Bild, as well as Oakleigh Chargers’ pair Hannah McLaren and Daisy Bateman in place of Paris Davey and AFLW players, Ruby Schleicher and Sarah Dargan. After last weeks big win against Williamstown, the Cats have made a number of changes to their list, bringing in Madison Maguire, Hannah Mangan and Cassie Blakeway. GWV Rebels defender, Georgia Clarke has been named as 23rd player, replacing Bianca Cheever. Lara Williams, Emily Ramsay and Maddison Janssen have also been named out for round four. Carlton have made six bold changes to their line-up. The biggest of them all is perhaps Gippsland Power co-captain, Tyla Hanks making her debut for the side. She has been part of the AFLW Academy and will hopefully bring the Blues the class they missed against Hawthorn last week. Also coming in is newly appointed vice-captain, Katelyn Cox and AFLW players, Sarah Hosking, Kerryn Harrington and Lauren Brazzale. Jorja Borg has also been recalled to the side as 23rd player. The Saints and Essendon will take to Trevor Barker Beach Oval this Sunday, and both teams have named a few changes. After their clutch win to the Demons last week, the Saints have named two outs including Sophie Bolding and Jennifer Vissenjoux. Sandringham Dragons duo, Eleanor Brown and captain, Jemma Owen have been named to fill their shoes at their home ground, and will be joined by Eastern Ranges midfielder, Gabriella De Angelis in the line-up. Dandenong Stingrays defender, Shelley Heath has been named as an emergency. Essendon’s ins include an exciting TAC Cup Girls product in Oakleigh Chargers ruck, Bridie Winbanks. Winbanks has been named as the 23rd player and would be hopeful of a debut at Sandringham. 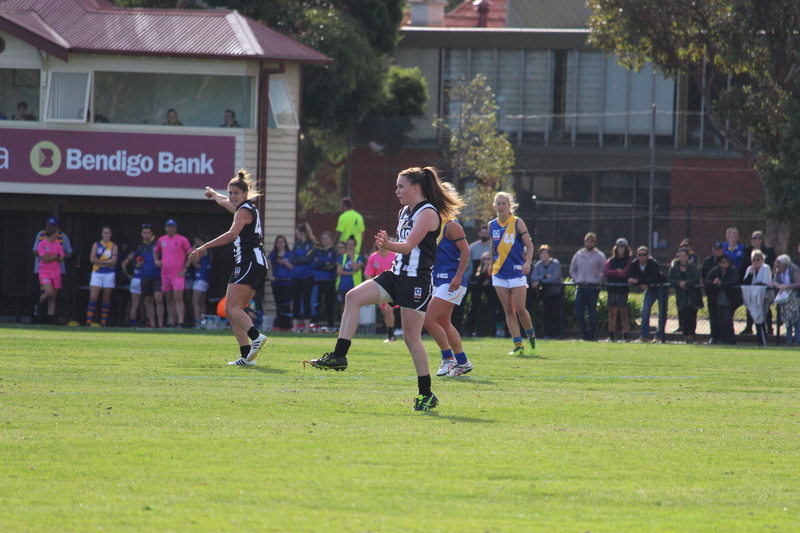 However, there is a massive out in the side with key forward, Danielle Ponter taking to the sidelines. After three winless rounds, Williamstown will be hungry for the win this week and they have brought in some fresh talent to take on the Tigers. Maddison James, Jessica Kile, Kaitlin Smith and Sharni Dixon will miss out this week, leaving room for Georgia Harris, Stacey Cross and Rebecca Dardengo. On the AFLW side of things, we’ll see new North Melbourne duo, Jenna Bruton and Jasmine Garner return to the line-up. The side also has no shortage of TAC Cup Girls talent with Bendigo Pioneers captain, Megan Williamson and GWS forward, Sophie Van De Heuvel making their debut for the Seagulls. Richmond have made four changes in the lead up to their contest against Williamstown. Ruck, Jenna Colwell and Bethany Lynch have been named out while Courtney Wakefield, Grace Bibby and Collingwood AFLW talent, Amelia Barden will pull on the yellow and black guernsey.